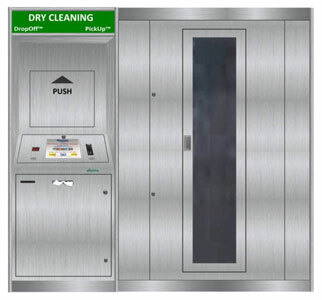 Dry Cleaning & Laundering History: In 2000 working with store operations management of a prominent supermarket chain interested in providing Professional Cleaning Service for its customers, but not wanting a facility built in stores, eAnytime constructed separate DropOff™ & Fixed Position PickUp™ kiosks and deployed them in select stores serviced by contracted with dry cleaners and in 2003 introduced kiosks with an integrated DropOff™ & Fixed Position PickUp™. In 2008 eAnytime™ introduced an integrated DropOff™ & Revolving Conveyor Pickup™ and in 2010, taking a page from our other industry kiosks, introduced an integrated DropOff™ & Locker & Drawer PickUp™. 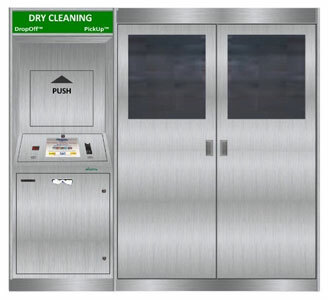 eAnytime kiosks are a cost effective alternative to a staffed drop store and individual order home & office pickup and delivery route and enable dry cleaners to reach out to new customers by deploying them in concessions in supermarket & convenience stores, office & apartment buildings, large employers, hotels, casinos and universities, etc. eAnytime kiosks are MADE IN USA of epoxy-coated and stainless steel and designed so that they are able to be shipped in sections abroad and assembled in countries where they will be deployed. eAnytime kiosks are mobile and have hidden lockable wheels and floor levelers for ease in placement and our interactive computer kiosks feature an integrated touch screen, industrial computers with Windows operating system, stereo speakers for instruction & interactive sound, a magnetic card reader, barcode scanner, thermal receipt printer, UPS/SPD, and diffused lighting from the illuminated marquees, a motion-sensitive surveillance camera in the Fixed Position PickUp™, Airflow™ ventilation in the DropOff™ & PickUp™, and in our Fixed Position and Revolving Conveyor PickUp™ internal lighting. Our interactive computer Fixed Position & Revolving Conveyor kiosks have onscreen icons for customers to touch to see text and hear instruction in a language a of choice, to learn about weekly specials and address Dry Cleaning, Laundering, Alterations, Household, Leather, Furs, and as an option Shoe Repair and each category is listed separately with its own menu and service calendar. FIXED POSITION are 8.5’Wx2.75’Dx6.5’H or 5.5’Wx2.75’Dx 6.5’H and have SIXTY or THIRTY 2”W SecurShield™ locking hanger-holding positions on an upper and lower bar the width of the PickUp™. REVOLVING CONVEYORare 8.5’Wx5’Dx6.5’H and have THIRTY 4”W hanger-holding positions. 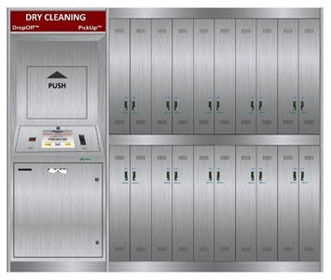 LOCKER Kiosks are 8.5’or14’Wx2.25’Dx 6.5’H have a separate 3’W DropOff™ for bagged dry cleaning & laundering orders and a 5’ PickUp™ with TWENTY lockers and with an additional 5.5’ PickUp™ attached to the other side of the DropOff™, FORTY 6.5”Wx27”Dx36”H SecurShield™ locking Lockers with self-closing doors for PickUp™ of finished orders. The top lockers have a flat grooved hanger-holding bar across the width of the kiosk passing though the walls of each of the lockers and the lower lockers have individual 6”W pivoting flat grooved hanger-holding bars in each. An upper and lower locker can be used together to hold orders with long garments, by unlocking and lifting the hinged lift-up floor of the top locker and pivoting the flat grooved hanger-holding bar in the lower locker and placing them flush against the wall of the lockers to create an unobstructed space 5.5”Wx27”Dx72”H. If an upper and lower locker is used together, the lower locker remains locked and the customer lifts the order out through the top locker. The bottom of lockers can be used for finished boxed orders. 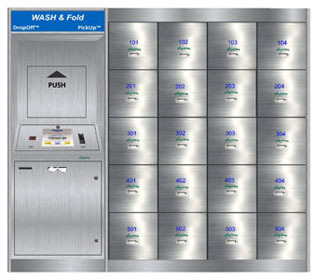 DRAWER or LOCKER Kiosks are 8.5’ & 14’Wx2.25’Dx6.5’H and have a separate 3’W DropOff™ for bagged laundering orders and TWENTY or FORTY PickUp™ 15”Wx27”Dx15”H SecurShield™ locking self-closing Glide™ drawers OR self-closing lockers for PickUp™ of bundled orders. New Customer Registration: Customer touches [New Customer], Inserts & removes a credit or debit card to register it and using the onscreen alpha-numeric keyboard enters their first name, last name, a phone number (the last four digits of their phone number is recognized as their Personal Identification Number (PIN) for orders) and an email address (optional). If the phone number entered is indentified as a cellular phone and, or an email address is entered, the customer can elect which to use for the computer to send a reminder text or email message to the them when their finished order is in the kiosk, ready to be picked up. DropOff™: Customer inserts and removes a registered credit or debit card, touches the DropOff™ icon, selects [Dry Cleaning][Laundering][Alterations][Household][Leather & Furs] optional [Show Repairs]items, enters quantity and special instructions if any including , using icons or free-form text. Next customers select from a two-week moving calendar the day that they would like to pick up their order - If PickUp™ capacity is reached they are asked to pick another day. Their registered credit or debit card is charged for the service at the kiosk and processed using land or wireless Internet. Customer receives two receipts, one to put in the order bag available at the kiosk or brought from home, and the other to retain for PickUp™. 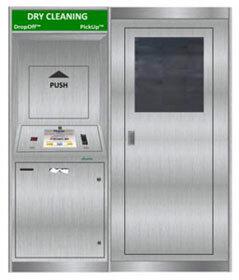 The DropOff™ door unlocks and the customer deposits their order. PickUp™: Service Provider unlocks the circular key locked DropOff™ door and removes the orders customer deposited in DropOff™, scans a master barcode tag, touches PickUp™, administrative reports are printed i.e. list of deposited orders, list of customers who did not pick up their order on the day selected if any, list of orders not put in PickUp™ on day scheduled if any. DropOff™: Service Provider opens PickUp™ door(s) and secures them open. Using a barcode scanner scans a garment bag and a hanging position which unlocks, lifts the SecurShield™ and places the order on the hanging position, and continues to scan and place orders in the PickUp™. When finished, release the doors which self-close and lock, touches Finished and a report is printed listing the orders placed in the PickUp™ with names and hanging position(s) on which the order is placed and the screen returns to the home page. Customers are automatically called or sent an email stating that their order is ready for PickUp™. PickUp™: Customer touches PickUp™, scan their receipt or insert and remove their registered credit or debit card if they do not have their receipt. Order position(s) in the PickUp™ are displayed on screen and if a Fixed Position kiosk, one or both doors of the PickUp™ unlock and the customer reaches in, flips-up the unlocked SecurShield™ covering the top of the hangers in the position(s) holding their order and when they remove their order a motion-sensitive camera takes pictures. If a Revolving Conveyor kiosk, the conveyor revolves to the correct position and if the order is in more than one position, the customer after removing the order from the kiosk releases the PickUp™ door, the conveyor revolves, and the door again unlocks.